Don’t get ripped off! Cheap Broadway tickets for New York shows are a reality online, in line and elsewhere. There's no shortage of enticing Broadway or Off-Broadway shows these days, but the steady rise in ticket prices has made it harder for theater lovers to take advantage of what New York's stages have to offer. The situation is not as dire as it seems, though: Discount Broadway tickets are everywhere, and modern technology makes it easier than ever to find cheap seats. If you play your cards right, you can even find them for sold-out smashes like Hamilton and Dear Evan Hansen. Here are the five best ways to score cheap Broadway tickets. The classic way to find deeply discounted tickets is to wait in line, on the day of the show, at TDF’s TKTS Booth under the red steps in Duffy Square (47th Street and Broadway). All but the biggest Broadway hits are on sale there, mostly at 50 percent off. If you are not looking to see a musical, the Times Square booth has a "Play Express" window that will cut down your wait time. 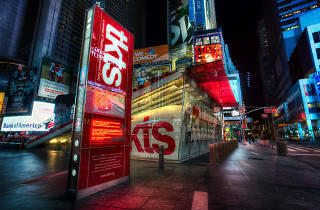 In addition to its flagship Times Square location, TDF operates two other booths in the city. The newest one, at Lincoln Center’s David Rubenstein Atrium (Broadway at 62nd Street), opened in 2016 and is the best option of the bunch: It’s only 15 blocks from the main booth but it’s far less crowded—and it’s indoors, which is a big plus in inclement weather. The other is at South Street Seaport (corner of Front and John Streets). The two non–Times Square locations sell matinee tickets a day early. As a general rule, the earlier you get to TKTS the better, but blocks of good seats are sometimes released closer to curtain time. 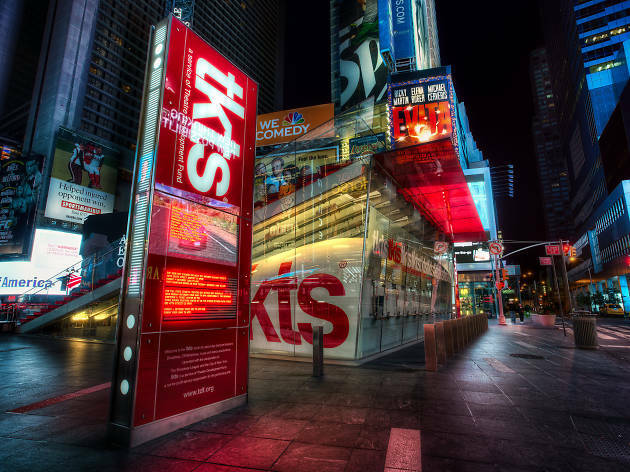 To see what is available on a given day, download the TKTS app or visit its website. You can buy up to six tickets per person at a time; there is $5–$6 fee per ticket, which is substantially lower than the fees on most ticketing websites. A handful of productions, including Wicked, still offer cheap day-of tickets through an old-fashioned in-person lottery, with names drawn at the box office a few hours before curtain time. But most Broadway shows now conduct such lotteries digitally, either on their own or through TodayTix. The most competitive are the Hamilton lottery (which offers 46 $10 seats a day) and the Harry Potter and the Cursed Child lottery, which is held once a week on Fridays. To find out which shows offer rush tickets and lotteries, consult the handy listings at Broadway for Broke People or Playbill (which offers both Broadway and Off Broadway guides). If the show you want to see is a big hit, you probably won’t be able to secure a discounted ticket, but there are still ways of minimizing the amount you’ll pay. Buying tickets directly at the box office will let you avoid cumbersome service fees, and you can sometimes find very good seats—formerly reserved for house seats or premium sales—that have only recently been added back to the ticket pool and have not yet been scooped up and marked up by scalpers on the resale market. (Be nice to the box office attendants and they may give you some tips.) And speaking of the resale market: You can sometimes snag tickets at great prices if you are willing to go to the theater right before the show begins. Even for very popular shows, prices on sites like StubHub and VividSeats can fall dramatically right before curtain time, as vendors scramble to unload their unsold tickets. If you’re in the right place at the right time, you might get lucky. For $30, if you're eligible, you can get an annual membership to TDF, which lets you use ticket deals days or weeks before the show. TDF also lets you see Off-Off Broadway shows for just $9 through its OffOff@9 program. Most of the city's major theater companies offer membership packages. You pay a fee up front (say, $65) in return for discounted tickets all year; what's more, you get the chance to buy tickets before they go on sale to the general public, which can be a big deal when it comes to shows with a lot of advance buzz. And membership often has other privileges as well, like the 20 percent food-and-drink discount you get at Joe's Pub when you belong to the Public Theater. 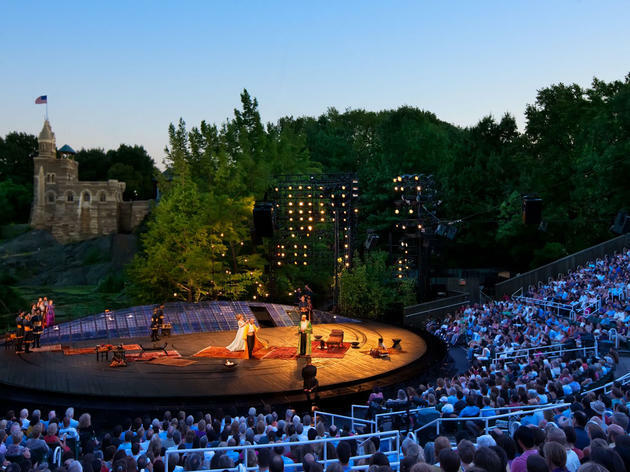 The trick is to pick companies that showcase consistently strong work, such as Playwrights Horizons, New York Theatre Workshop, Atlantic Theater Company or Ars Nova. The city’s biggest nonprofit theaters all have programs aimed at encouraging younger audiences. Theatergoers ages 18 to 35 can buy tickets to Roundabout Theatre Company for just $25 per show by joining its Hiptix program. If you're between 21 and 35, you can join Lincoln Center Theater's LincTix program, which offers $32 tickets to all shows. Manhattan Theatre Club’s 30 Under 30 program, as the name suggests, allows patrons 30 or younger to buy tickets for $30. Other major companies, such as Playwrights Horizons, also offer programs for young theatergoers. Students and seniors have access to many special discounts to Broadway and Off Broadway productions. Librarians, teachers and students can pick up vouchers for 30 to 50 percent off through the School Theatre Ticket Program at schooltix.com, and students ages 13 to 18 can buy $5 tickets to certain Off and Off-Off Broadway productions through High 5 Tickets to the Arts. 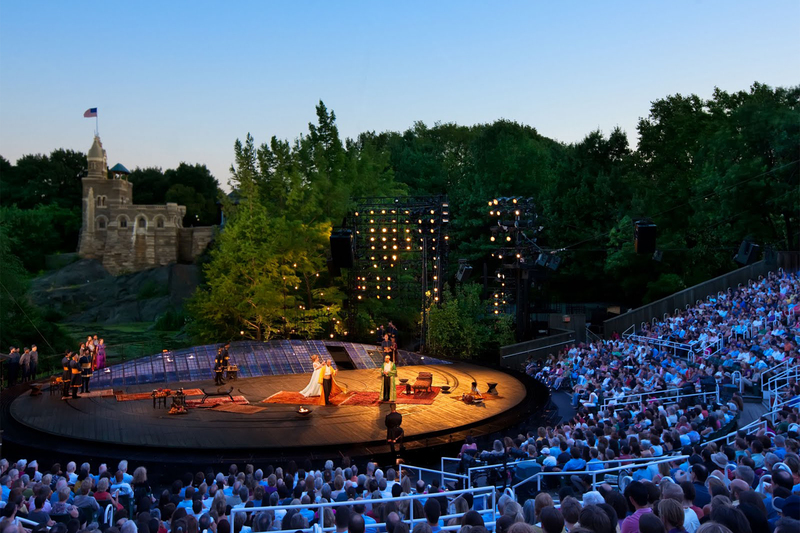 Want to see Shakespeare in the Park?